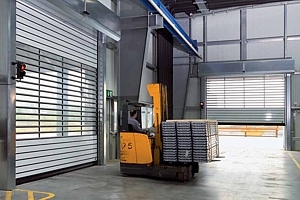 Samson Doors offer a comprehensive range for high speed flexible roller and high speed insulated eliptical doors for internal and external installations. 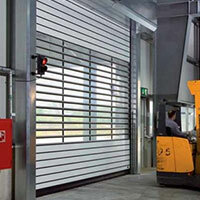 To view our High Speed Roller Door in our shop, click here. 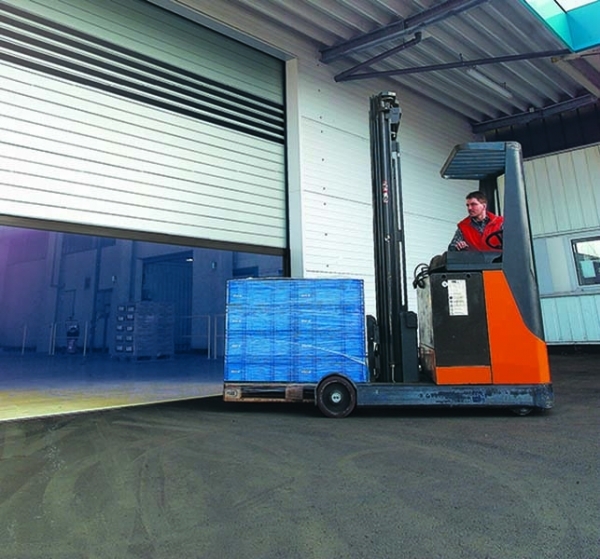 Soft Edge high speed doors with anti-crash technology offer Increased safety and almost no need for repairs when a door has been hit by a forklift driver with a pallet load. Injuries to any persons involved in a high speed door crash are almost non existent due to the very high vertical flexibility of the bottom profile of the door, giving in as it is hit and ultimately leaving the side guides to ensure minimal damage all round. No downtime after a crash into a speed door! 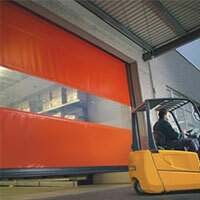 The innovative SoftEdge door technology prevents damages and resulting downtimes of the door system. 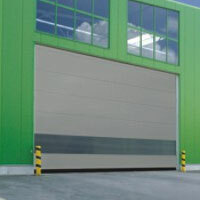 Extensive repairs, such as those with rigid industrial and roller door designs do not become necessary. 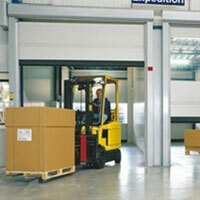 SoftEdge ensures trouble-free operation and production and transport processes continue uninterrupted. All of the high speed doors supplied and installed by Samson Doors have an extensive range of controls ranging from the simplest of push buttons through to finger print readers. All the controls are tied in with the highest levels of safety with infra red light grilles in the lower half of the door to work alongside the very sensitive bottom edge sensor system of the door making sure nothing is ever crushed accidentally. Is the Door for use Inside the Building or on the External Fabric of the Building? i.e. Inside or Outside use, but be aware of being clear on this and not misinterpreting ‘inside’ to mean on the inside face of an external opening as this does happen. 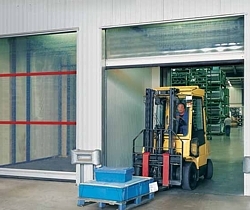 The various high speed fabric doors have different ratings for internal or external use and one main difference will be wind load ratings which need to be higher for external use. Door Opening Size? What is the aperture size as various models have a maximum size. The bigger the high speed door the bigger the side guides and headroom required will be as in all roller type doors so be aware of this. Single or 3 phase electric operation? 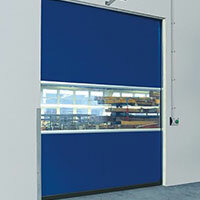 If 3 phase is available it is usually better to specify, but many modern high speed fabric doors use single phase motors and have an inverter to convert the electric to 3 phase for the motor drive. Very high usages will probably need three phase. Door Controls? What is expected for the control of the door? 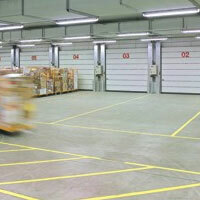 A loop detector in the floor is common as is a radar system nowadays, both will detect the presence of a vehicle and open the door. These will not open for pedestrians usually. A simple pushbutton or even a pull cord on an extended arm is sometimes required and for security you could specify a key switch, card reader or coded pad. 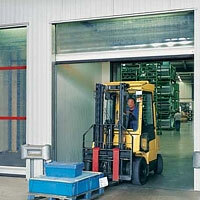 Safety is also a big consideration if the door is auto closing, which most will be. You need a minimum of a light grid detection system across the opening and then there are additional safety devices such as a bottom edge sensor or additional infra red beams either side of the door. Particular attention needs paying if the high speed door will have pedestrian traffic through it. The radar system which opens the door can also be used to prevent the door closing on some models. Later high specification radar systems are very intelligent in their operation. Is the Area Windy? It is common to have high winds on an external opening depending on the location and aspect of the building. Very exposed locations need careful attention to doors with windsock guides and the same goes for an internal door where there might be a ‘wind tunnel’ effect for any reason. This needs to be established before recommending the right door model and specification. 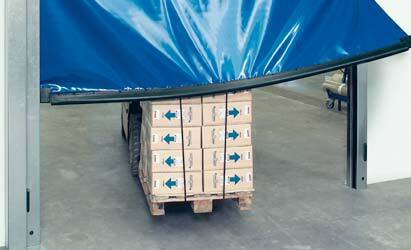 IMPORTANT NOTE: Wind ratings for high speed roller doors will only refer to the wind rating in a 'closed' status and not during operation so it is important to realise this and be fully aware of the potential problem of wind in the installation position. Speed of opening? A consideration for some but most doors will open at an approximate rate of 1.5m per second which is fast enough for most. Up to 3m per second can be achieved if required maybe on larger openings. The closing speed will always be slower for obvious safety reasons. Solid, Semi or Full Vision Curtain? 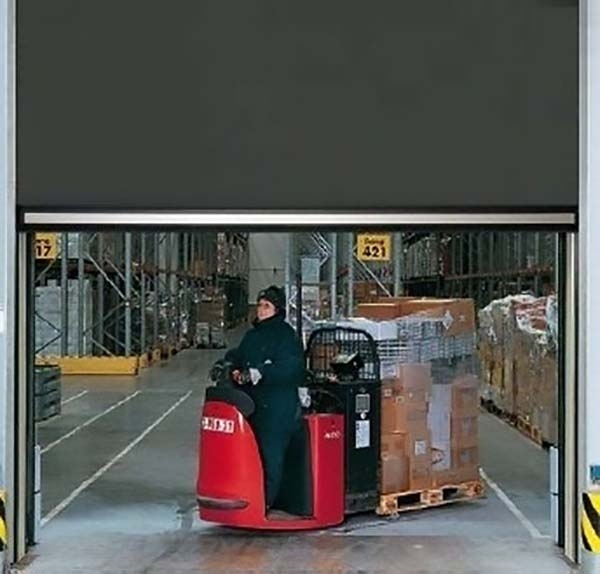 Many high speed doors have a vision panel in the middle to see the other side and potential danger from approaching traffic if it isn’t a one way traffic system. You can have certain models with a fully clear curtain but be aware os cheaper versions of this because the curtain can degrade and become ‘milky’ quite fast if it isn’t of a high quality in the first place. Any Extreme Temperatures? 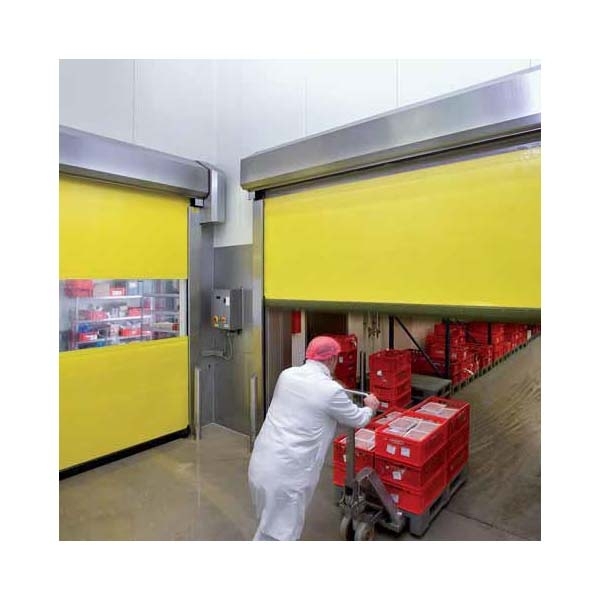 Certain high speed door models can deal with higher and lower temperatures if required depending on the environment for installation but most will have a fairly good range as standard. 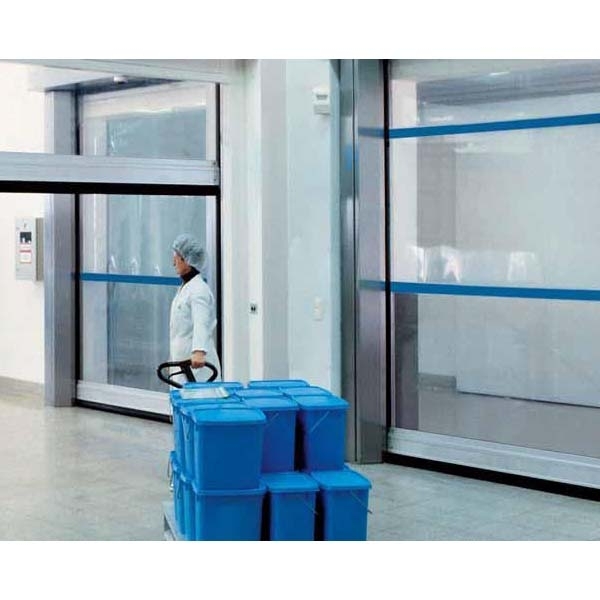 Any exceptional environmental issues ned clarifying before specifying the door such as dust, high moisture content or other issues in the proximity. Is there a Requirement for a ‘Clean’ Status? Usually where food or pharmaceuticals are involved. Some models are manufactured using stainless steel components, aluminium guides another features to provide the highest quality of door which can be kept clean as required. 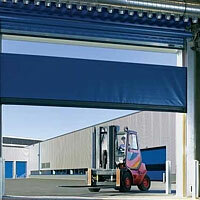 Samson Doors can provide quotations for most high speed door types and offer a choice of models and specifications. 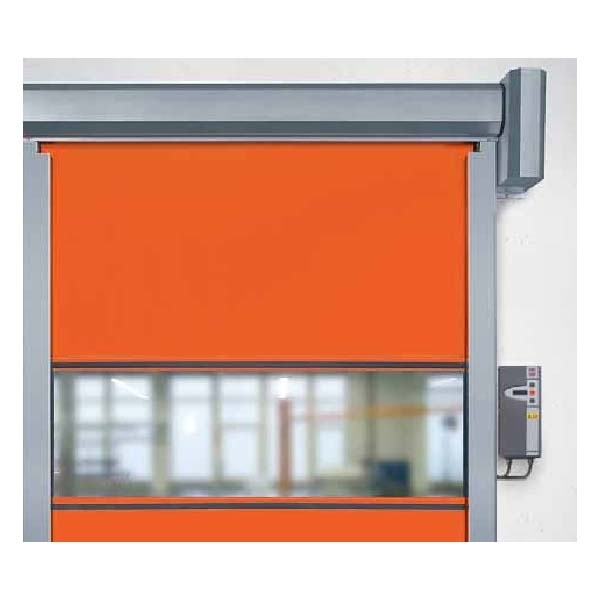 The modern method for a new opening is to use a high speed insulated 'spiral' door system which combines the benefits of an insulated and secure roller shutter with the high speed action required, all in one door. They are an investment for sure but with minimal contact they are also low maintenance compared to 2 doors in one opening so benefits are realised quite quickly in running costs and efficiency.